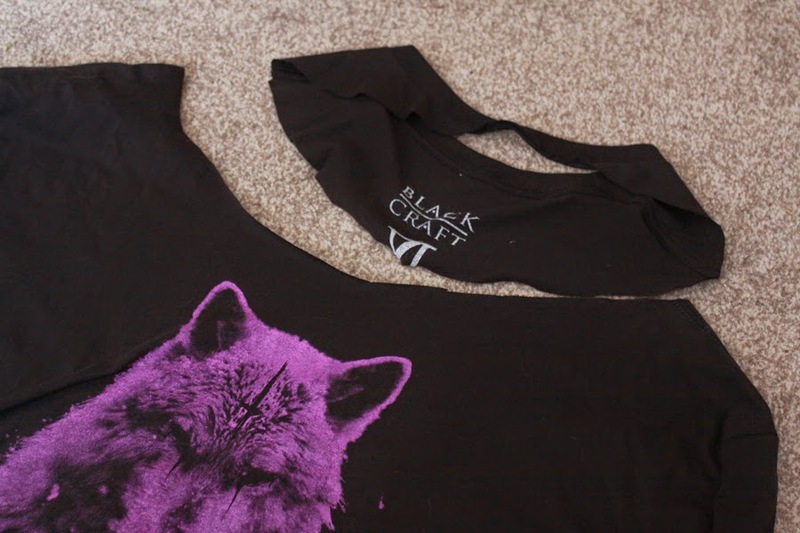 Kitty Rambles A Lot: An Easy Way to Customise Band Shirts! I love getting band t shirts from gigs, but women's options tend to be on the tiny side. Instead, I like to buy men's t shirts and cut them up for something totally different. As a rule, I buy a shirt at least 1 size bigger than I need as I like the slouchy fit. You also need to be careful with what print your shirt has, if it has a list of tour dates on the back be very careful with where you cut! First off, pick your shirt. 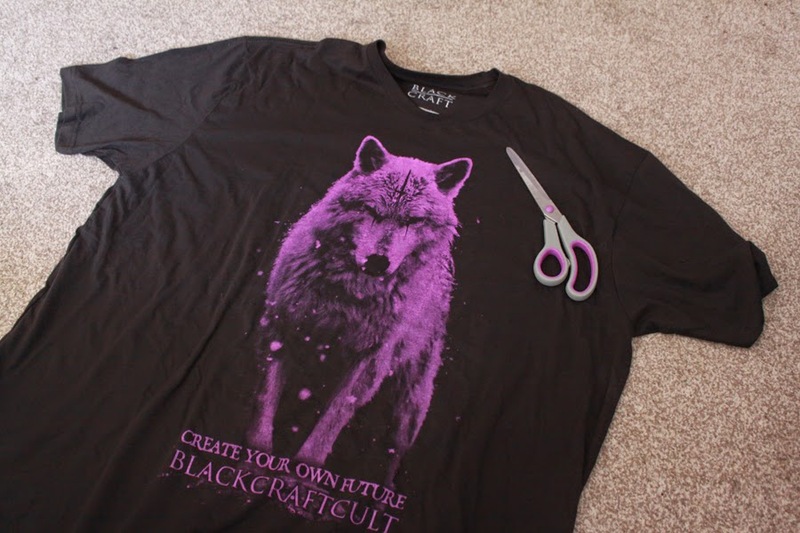 In this example, I'm cutting up a BlackCraftCult Lone Wolf Limited Edition Purple tshirt, this particular t shirt is sold out as it was limited edition, but they have it in their standard white colour for $24. I love BlackCraftCult's designs and wish I had more. I have paid customs on them every time they've been delivered to me, but they are so soft, and such good quality, that they are worth those few extra pennies, they are a great price to begin with. 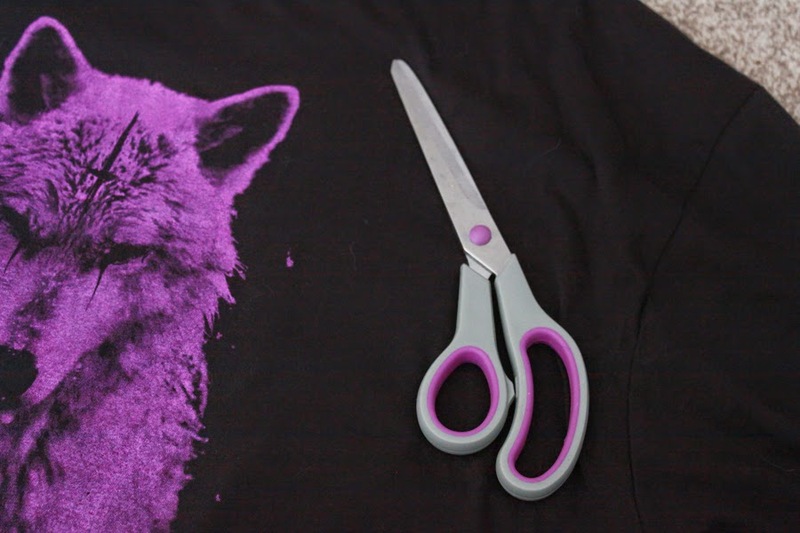 I have used regular kitchen scissors previously when I've cut up t shirts, but it is so so much easier with fabric scissors, it's much easier to get a good smooth line. Mine cost £4 from Asda and have a very comfortable grip. First, I always cut the neck out. I love off the shoulder styles and it is so easy to do with a men's t shirt. Going from the seam with the sleeves, I start cutting at about half way between that seam, and the neck of the t shirt. I work in a smooth line going to directly underneath the neck of the t shirt, then back out again to the half way point on the other side of the t shirt. As you can see, I take very little fabric out from underneath the neck of the t shirt, and instead cut more from the back. This makes sure that the neck is even, and hangs nicely. Be very careful with how much material you take out here, because there are no seams, it will stretch slightly as you wear it! Next I tackle the sleeves. An easy and fun way to customise them is to make sure the sleeve is flat and even, and starting from the bottom, cut from the outside of the sleeve to the inner seam in approximately thumbnail sizes sections. By the time you get to the top of the sleeve the very last part will likely be too big to leave as one section, and too small for the usual section. What I do is cut it in half, because the top part will remain as one once the sleeve is unfolded, it is bigger than it looks it will be. See! Super easy, and a great option for festivals. I have so many t shirts like this now, and a few more I wish to cut up as well. I cut this one up specifically to photograph for this blog, so here I am wearing one of my other shirts that I have done the same as this. Isn't it cute? Perfect festival wear.